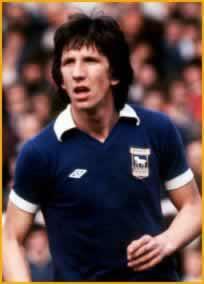 Paul Mariner was one of my favorite players in the late 1970's. On cold winter nights listening to Toby Charles on Soccer Made in Germany, Mariner was the diminutive Center Forward for Ipswich (and England, 35 caps) who dominated the penalty area, heading or chesting back the long balls hooked in from the shallow flanks. Now & again, on soggy pitch beyond reckoning, somebody would strike one of these first-time for spectacular results. Now Mariner turns up State-Side as assistant to his old mate Stevie Nicol (Arsenal), Manager of the New England Revolution in the MLS. Paul Mariner seems to lament the new teetotalling direction the game has taken: "As for alcohol, it's a coffee society really, rather than a drinking society, innit? If I think back to Ipswich in the Seventies, I reckon Bobby Robson would have been more worried if he'd seen us turning up to work with lattes than with beers." Having come over in the late 1980's after the demise of the NASL, Mariner comments insightfully about the North American game, "The players were exceptional athletes: their physical conditioning would have put many English players to shame, including me. Yet they didn't have the same speed of thought." It's my own view that this is still the case; and until we can sing "You'll Never Walk Alone" at Giant's Stadium as harmoniously as they do at the KOP END, then players here will continue to dream away and my footballing eye stays on Europe.